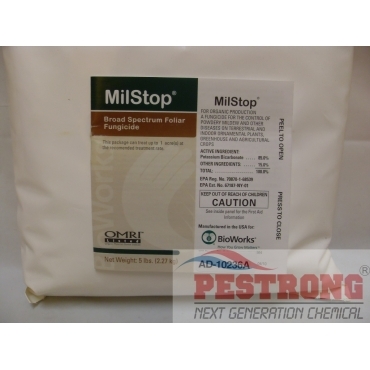 Where to Buy MilStop Fungicide, MilStop Broad Spectrum Foliar Fungicide - 5 Lb - $62.90 for Sale with Fast Free Shipping! MilStop Broad Spectrum Foliar Fungicide - 5 Lb for the control of powdery mildew and other diseases on terrestrial and indoor ornamental plants, greenhouse and agricultural crops. Catchmaster Glue Board Traps - 72TC, 72MB,..
MilStop for curative control of powdery mildews and preventative control of most other foliar diseases. MilStop is an EPA-registered, potassium bicarbonate-based foliar fungicide that kills powdery mildew on contact by pulling water from spores and their growing strands. It also inhibits enzymes involved in fungal cell wall formation by altering the pH on the leaf surface. There is no known resistance to MilStop. An excellent disease management tool as a standalone fungicide for foliar disease control or alternated as part of an integrated pest management program. Curative control of powdery mildews: A potassium bicarbonate-based, foliar fungicide that kills powdery mildew on contact by pulling water from spores and their growing strands. It also inhibits enzymes involved in fungal cell wall formation by altering the pH on the leaf surface, providing 1-2 weeks of residual protection. Preventative control of foliar diseases: Diseases controlled include Alternaria blight, Anthracnose, black spot, Botrytis blight, Cercospora leaf spot, Downy Mildew, Phomopsis blight, and Septoria leaf spot. This 5 lb can cover up to 2 acres. Site: Foliar, Ornamental Plants over Greenhouse, Lathhouse, Shadehouse, Commercial and Residential Landscapes, Interiorscapes, Nursery, Container Production, Orchard and Field Applications. I am very impressed with this product. It worked quickly to keep my plants from succumbing to powdery mildew. I have very healthy plants that look like they've never had any kind of mildew on them at all. Works really well. Glad to have found this product. Thanks a lot!